Property Location A stay at Comfort Inn Gaslamp Convention Center places you in the heart of San Diego, walking distance from Lyceum Theatre and Westfield Horton Plaza. This hotel is close to San Diego Convention Center and Balboa Park. Rooms Make yourself at home in one of the 103 air-conditioned rooms featuring refrigerators and flat-screen televisions. Your pillowtop bed comes with down comforters. Cable programming and video-game consoles are provided for your entertainment, while complimentary wireless Internet access keeps you connected. Private bathrooms with shower/tub combinations feature designer toiletries and hair dryers. 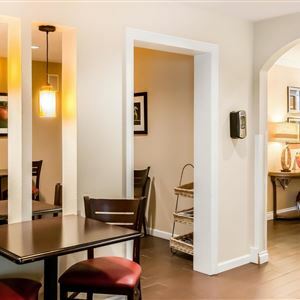 Amenities Make use of convenient amenities, which include complimentary wireless Internet access and a television in a common area. Dining A complimentary hot/cold buffet breakfast is served daily from 6:30 AM to 9:30 AM. Business, Other Amenities Featured amenities include a 24-hour business center, express check-in, and express check-out. Planning an event in San Diego? This hotel has facilities measuring 300 square feet (28 square meters), including a meeting room. Self parking (subject to charges) is available onsite. A stay at Comfort Inn Gaslamp Convention Center places you in the heart of San Diego, walking distance from Lyceum Theatre and Westfield Horton Plaza. This hotel is close to San Diego Convention Center and Balboa Park. Make yourself at home in one of the 103 air-conditioned rooms featuring refrigerators and flat-screen televisions. Your pillowtop bed comes with down comforters. Cable programming and video-game consoles are provided for your entertainment, while complimentary wireless Internet access keeps you connected. Private bathrooms with shower/tub combinations feature designer toiletries and hair dryers. Featured amenities include a 24-hour business center, express check-in, and express check-out. Planning an event in San Diego? This hotel has facilities measuring 300 square feet (28 square meters), including a meeting room. Self parking (subject to charges) is available onsite.